Our range of products include shrink wrapping machine. Adhisakthi design and deliver a wide range of custom designed bundling and shrink wrapping machines suiting to various needs of customers. The machine finds it applications in end of line automation and to shrink wrap individual products like container, cartons, shrink labels etc. Machine is used to shrink various types of PVC shrinkable sleeves, poly olefin films, LD films etc. 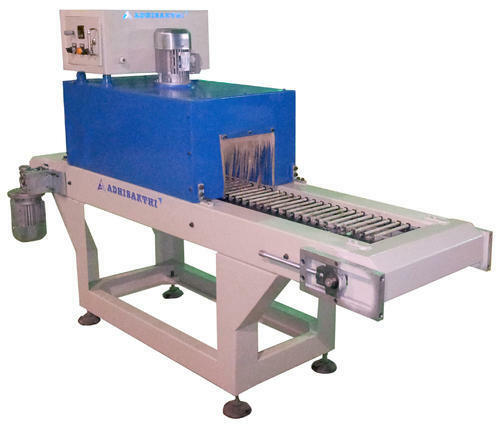 The machine contains customized product infeed and collating system. Bottom and top film dispensers with auto unwinding mechanism. Pneumatic components of FESTO/SMC Make. Heating chamber is an insulated construction fitted with suitable heaters. Size of the tunnel would depend upon the requirements. Option of In feed conveyor models. 2. PTFE Mesh Belt Based. Temperature setting up to 300 deg. Controlled with PID Temperature controllers. Conveyor speed is variable with the help of AC variable frequency drive. Uninterrupted running with simple system for heater replacement. Main Conveyor drive with Bonfiglioli geared motors. Options of Single duct, double duct and triple duct available matching to pre shrinking and final shrinking needs. Looking for “Shrink Tunnel Wrapping Machine”?